Just before the election this fall, the US war in Afghanistan will pass its fifteenth birthday, making it old enough to obtain a driving learner’s permit in most states. Despite the fact that the Taliban government fell after only eight days of the war, the US has inexplicably stayed in the country, ostensibly maintaining peace, eliminating a small force of al Qaeda and “training” Afghan defense forces to take over. During that time the US has expended an ungodly amount of money, lost thousands of US troops and been present for much larger losses of life throughout a country that also has seen unacceptable numbers of internally displaced people. All of this has taken place while Afghanistan has continuously been found at or near the top of the list of the most corrupt nations on the globe. Now, nearly fifteen years into the misadventure, we see that conditions in Afghanistan are deteriorating at an ever increasing rate. The Special Inspector General for Afghanistan Reconstruction today issued its 30th in its series of quarterly reports to Congress (pdf). Nothing in the report provides any hope that Afghanistan will emerge from the US war nightmare as a functional country any time soon. 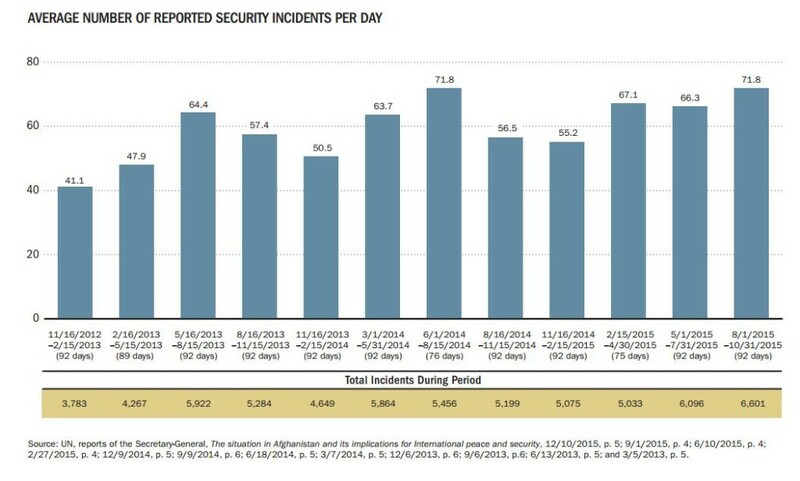 UN data on Afghanistan security events as presented in the SIGAR quarterly report, January 2016. Although sources and methods of reporting on violence levels in Afghanistan have changed over the years, consultation with posts here and here shows that since the days when troops were diverted from the misadventure in Afghanistan to the even bigger misadventure in Iraq, violence has trended only upward. Another key feature of the US “activities” in Afghanistan has been the “training” of Afghan forces to step up and take over primary responsibility for defense of the the country. The US has disbursed over $56 billion in this training and equipping effort. After years of SIGAR reports carefully documenting the numbers of Afghan troops trained and the capabilities of those forces, we suddenly encountered a wall of classification of Afghan troop capabilities last year as the US effort in Afghanistan was “ending”. However, a January Associated Press report alleged that the actual number of ANDSF security forces is far less because the rolls are filled with nonexistent “ghost” soldiers and police officers. In that report, a provincial council member estimated 40% of the security forces in Helmand do not exist, while a former provincial deputy police chief said the actual number was “nowhere near” the 31,000 police on the registers, and an Afghan official estimated the total ANDSF number at around 120,000—less than half the reported 322,638. The success of military operations is at risk, because as one Afghan soldier in Helmand said, they do not have enough men to protect themselves. Additionally, an Afghan lawmaker claimed the government is not responding to the crisis because a number of allegedly corrupt parliamentarians are benefiting from the “ghost” security forces salaries. This quarter, details of ANDSF force strength at corps level and below remained classified. SIGAR will report on them in a classified annex to this report. USFOR-A reports that approximately 71.7% of the country’s districts are under Afghan government control or influence as of November 27, 2015. Of the 407 districts within the 34 provinces, 292 districts are under government control or influence, 27 districts (6.6%) within 11 provinces are under insurgent control or influence, and 88 districts (21.6%) are at risk. In a report issued in December, DOD stated that the security situation in Afghanistan has deteriorated. There are more effective insurgent attacks and more ANDSF and Taliban causalities. However, DOD remains optimistic that the ANDSF continues to improve its overall capability as the capabilities of the insurgent elements remain static. This completely unfounded and contrary to all available data assessment by DOD of the situation in Afghanistan says everything we need to know about how these geniuses have failed at every step of the way in a mission that has mired the US in a quagmire that anyone could have predicted before the first bomb fell. Time to declare victory, defeat, whatever, and get the hell out. The model has been well developed by invaders of Afghanistan for millennia. No, the amazing part is that, mot content with one quagmire the military is lobbying actively to be given another crack at Iraq, mass boots for the ground in Syria and take care of that Libyan business that Mrs Clinton insisted upon. And then there are the guys who are busily pursuing a forward policy in Europe-setting up bases on Russia’s borders, training Al Qaeda types in the backwoods of Georgia and repeating the “training” gambit in Ukraine. And then there is the Black Sea, where there appear to be daily exercises in the Great Game of Chicken. The wonder is that there are still other strategic thinkers, in the military and its circles, pushing for some headbanging in the South China Sea and fluffing up the Anzac and Japanese warmongers. Now how about South America? It’s hard to comment on news that has been so obviously manipulated by the US government to be totally non-informative. Whatever the original intentions behind US interest in Afghanistan, there are enough old hands who will not let go. Western front of China or some such nonsense. Yet more pipelinestan on top of the Shanghai Cooperation Organization ones. In an era of declining fossil fuels and adverse consequences of both use of fossil fuels and of war. Fear of a collapsed state providing yet another matrix for a DAESH-style armed seizure of power. Triumph of regional warlords who have preserved their power through 15 years of Karzai trusteeship. And then there’s the control of all the bases that the US built for the ages. And most of all the testimony of those who were imprisoned as US enemy combatants in the prisons on those bases. The actual logistics of complete withdrawal most likely have become among the most high-risk scenarios for exit. The ancient phrase from the Vietnam era, “a pitiful, helpless giant” comes to mind. BTW, Jim, best wishes to you. Thanks for the kind thoughts. It’s a big relief that surgery is postponed until June and that I’m back to pretty normal activities. It was very frustrating to be limited in what I could do.